W. W. Norton & Company, 9780393340648, 304pp. A powerful, soaring novel about a stolen desk that contains the secrets, and becomes the obsession, of the lives it passes through. For twenty-five years, a reclusive American novelist has been writing at the desk she inherited from a young Chilean poet who disappeared at the hands of Pinochet's secret police; one day a girl claiming to be the poet's daughter arrives to take it away, sending the writer's life reeling. Across the ocean, in the leafy suburbs of London, a man caring for his dying wife discovers, among her papers, a lock of hair that unravels a terrible secret. In Jerusalem, an antiques dealer slowly reassembles his father's study, plundered by the Nazis in Budapest in 1944. Connecting these stories is a desk of many drawers that exerts a power over those who possess it or have given it away. As the narrators of Great House make their confessions, the desk takes on more and more meaning, and comes finally to stand for all that has been taken from them, and all that binds them to what has disappeared. 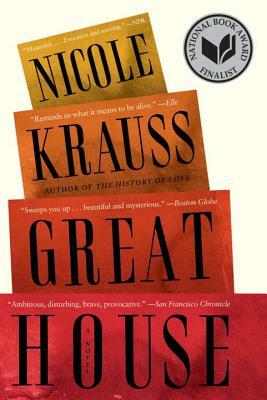 Great House is a story haunted by questions: What do we pass on to our children and how do they absorb our dreams and losses? How do we respond to disappearance, destruction, and change? The large and imposing desk in the novel is passed from life to life, moving through space and time to link the characters in the novel to one another and to the past. What does this inheritance represent for each? Is it a burden? A sense of loss—of a child, a parent, a lover, a home, youth, an illusion, and so many other things—suffuses the novel. How do the characters respond to loss, destruction, and change? The novel is composed of intimate and emotional monologues that each have the tone of a confession. What do Nadia, or Arthur, or Aaron feel themselves to be guilty of? What role does judgment play in the novel? Many of the characters are haunted by doubt or uncertainty, whether it’s moral doubt, self-doubt, or the doubt that comes with a realization of the limits of how fully known we can ever be to one another, of how often we must live unknown and unknowing. What is the nature of Nadia’s doubt, as expressed in the question that afflicts her: What if I had been wrong? What kind of uncertainty did Arthur feel in his marriage? And Aaron, as a father? What about Yoav and Leah Weisz? Why do you think Lotte chose to give her child away? And why did Nadia choose to give up children, her marriage, a social life—everything but her solitude? What other kinds of sacrifices do the characters make? What role does regret play in the novel? What is the significance of the locked and empty desk drawer? How does the story of Ben Zakkai and the destruction of Jerusalem—a response to catastrophic loss that led to a radical reinvention of Judaism that allowed it to survive in the Diaspora—relate to the rest of the novel?